Story by Maria Kanai. Photos by PF Bentley. I’m walking along Kaunakakai Pier with a maritime minister. Only don’t call it a pier, he tells me; the locals call it a wharf. In fact, it’s the longest wharf in Hawai‘i, stretching some 1,700 feet southward like a lonely gray finger extending out from Moloka‘i’s tranquil main town. The mirrored blue water alongside the wharf glints with startling flashes of yellow and silver from tiny manini and halalū fish darting about over the dark reef below. A few trucks and cars are parked on the side of the long, two-lane causeway, and an elderly gentleman on a bright yellow bicycle rides leisurely by. Tied to the moorings, a handful of fishing boats rock gently side to side. My companion is Clay Ching, associate minister at the Heart of Aloha Church and owner of Hallelujah Hou Fishing. With the trim build of a paddler and the weathered skin of a fisherman he looks just shy of 50, but he’s actually 70 years old. Ching tells me that, as the only commercial port on the island, Kaunakakai brings in everything the residents need: propane, diesel fuel, food, furniture. The pier here is one of the last in Hawai‘i still used to transport goods, because cargo is now mostly handled in modernized harbors or by air. Once upon a time, piers were the life-blood of every island. The sugar that moved through them drove the local economy for a century, and virtually every provision, item of merchandise and human being that came on or off the island crossed between sea and land over a pier. Whole towns would gather at the dock on “boat days” when ships would arrive. Today almost all of the old piers have long since been abandoned for cargo use, but a few remain as focal points of small Island communities, where local salts have gathered for generations to fish, play and trade the latest gossip. The piers have a life and culture of their own, and this is what I have come looking for in Kaunakakai. Fishermen launch by dawn’s early light at one of the seven boat ramps at Wai‘anae Harbor on O‘ahu’s west coast. 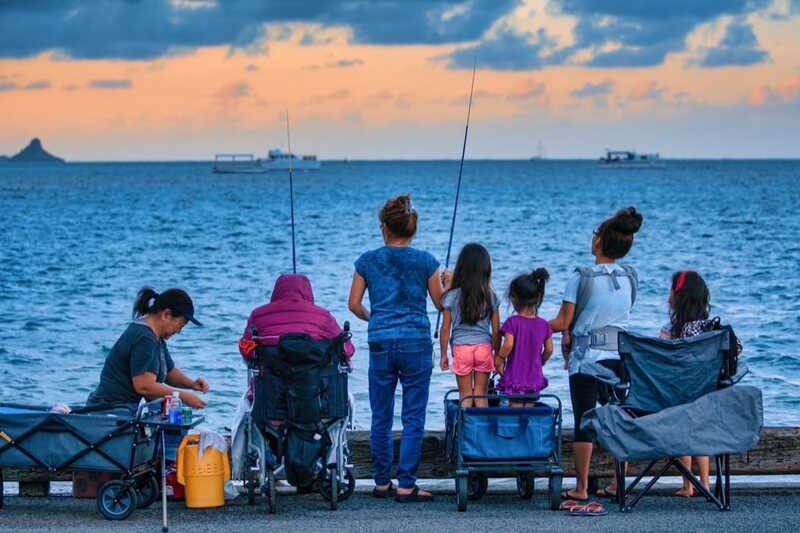 Once a sleepy commercial harbor, Wai‘anae has seen growing numbers of visitors as tourists flock to popular ocean activities. But when the ‘ahi (yellowfin tuna) are running the harbor still buzzes with local fishing craft, and boat trailers line the roadway. The American Sugar Company began construction of the wharf in 1899, with a small landing at the end that accommodated only two boats. In 1921 the causeway was extended and a narrow railroad track put in to handle cargo. The story goes that a railroad flatcar was drawn along the tracks by a reliable, flea-bitten mule named Hattie, who was then replaced by a brown mule named Hannah. In the plantation’s heyday, sacks of sugar and barrels of molasses from the Meyer sugar mill at Kala‘e were loaded onto bullock carts and taken to Kaunakakai wharf, where small boats transferred them to larger ships anchored in the harbor. Goods were landed at the pier for the island’s population of just a little over two thousand, and some were carried by mule down the cliff trail to the Hansen’s disease settlement at Kalaupapa. When supply ships from Honolulu sailed in, the harbor came alive with energy and excitement. There’s still excitement these days, especially for canoe paddling. “Paddling is a huge thing for Moloka‘i people, especially for the young ones, the hope and future of Moloka‘i,” Ching says. “Paddling is way better than, you know …” He mimics texting frantically on a phone. He himself is part of the local canoe club, and he says it’s common to see coaches making teenagers haul canoes weighted down with tires up the beach as a workout. Mondays and Thursdays are what Ching calls “freight days” at the wharf, when interisland cargo barges arrive. Since it’s a Thursday, we often have to pause mid-sentence as trucks loaded with Matson and Young Brothers shipping containers roar past us. He seems to know all the drivers, throwing each of them a shaka. Many honk in friendly response. Various wharf rats, as Ching calls them, stop to say hi: Cricket and Ray, an elderly couple who are out walking; Zac, a fireman with a white Jack Russell and Chihuahua mix terrier; and Samantha, a seamstress grandma who paddles and reportedly makes amazing salsa. Zac says the boat launch ramp is where everything happens. “This ramp, since it’s the only one for the whole island, is the lifeline for the community,” he says. Spectacular Hanalei bay is a visitor hub for kayaking and snorkeling, while residents use the pier to fish and swim. More than a few suitors have popped a marriage proposal out at the end, while others have gone there to scatter the ashes of a loved one. “You know, nobody has any secrets on Moloka‘i,” Ching tells me. “Everyone has a story and a reputation.” “What’s your reputation?” I ask. “Me? I’m the guy who takes care of everything.” He spots a leaking water spigot at the boat ramp and immediately walks over to shut it off, shaking his head. Tires are missing on the side of the loading dock; some of the wooden boards on the dock are coming loose; and there are fine cracks starting at the rusting base of a yellow lamppost—a light he petitioned for thirty years ago as part of a college political science project. He wants it fixed. Old Hawaiian stories tell of the souls of the dead coming to He‘eia on O‘ahu’s lush Windward side to be judged, whether light or dark, before leaping off into the spirit world. But for the overseer of a place that sounds so ominous, the harbormaster at He‘eia Kea Harbor, Ernie Choy, is a cheerful man with lots to say. We meet at his office, a humble shed next to the He‘eia Kea Pier General Store & Deli, which his family once owned for nearly thirty years. “Being a harbormaster is just like being a parking attendant,” he tells me, barely visible behind a large desk stacked high with piles of papers. “My job means dealing with a whole lot of paperwork and making sure that everyone gets along. But you can’t beat this view!” He gestures dramatically out the window behind him, where the sculpted Ko‘olau mountains sprawl along the horizon. A west side fishing crew cleans a hefty marlin they brought in to the dock at Wai‘anae Harbor. He‘eia is in the district of Ko‘olau Poko, once one of the most agriculturally productive regions in the Islands, yielding rich crops of taro, sweet potato, breadfruit and banana, along with plentiful fish from its large man-made fishpond. So fertile was the area that King Kamehameha kept the ahupua‘a (land division) of He‘eia as his personal property after he conquered O‘ahu. Sugar cane was introduced in 1865, and a pier was built in Kāne‘ohe bay so railcars could take the sugar out to boats for transport around the island to Honolulu. Following World War II, recreational boating increased dramatically in Hawai‘i as personal income and available leisure time climbed. In response, the Harbor Board constructed a series of small-boat facilities across the Islands, including a fishing wharf at He‘eia that was completed in 1950. A decade later it was expanded into a more spacious harbor with multiple docks. At 6:30 on a Saturday morning, I pull past a row of moorings into a small parking lot. To my right I catch the sun rising over an unusually still ocean to cast its first rays on the Ko‘olau ridgeline looming over the Windward side. I park and snap a photo—the view is remarkable, the air crisp. There’s a group of elderly gentlemen gathered around picnic tables outside the deli, including Army veteran Clinton Gurai and building maintenance worker Joe Medeiros. Gurai doesn’t talk much but Medeiros isn’t shy. He explains that neighborhood retirees will arrive in waves, and sure enough one by one they drive up to the parking lot. Most are pole fishers, but a few own boats and go out to sea to fish. There are military vets, former mechanics, plumbers, farmers and more. One man, parking his truck, yells out his window at his friend sitting at the table, “I gonna bang you, but not li’ dat!” to laughter all around. Once piers were the lifeblood of every island, and whole towns would gather at the dock on “boat days.” Today almost all the old piers have been abandoned for shipping, but a few remain as community focal points where local salts have gathered for generations to fish and trade the latest gossip. Outside the green walls of the deli, managing partner Dave Rodriguez is feeding a snack to his orange-and-green parrot Pakalolo. Inside the store, which has gone through several ownership changes in the last few years, the merchandise ranges from poi banana bread and coffee to puka shells and straw hats. “You know,” says Rodriguez, who has co-owned the store since the end of 2016, “this deli has been around for so long that my main challenge is making sure that the locals continue to accept us.” With at least ten retirees sitting at the tables outside, drinking coffee and talking story about their week, their families and their fishing triumphs, it looks like he’s succeeding so far. Stretching some 1,700 feet southward, Moloka‘i’s Kaunakakai Pier is the state’s longest. Ailā says the biggest change he saw during his years as harbormaster was the growth of tourism in Wai‘anae as ever-increasing numbers of visitors flocked to popular snorkeling tours and other ocean activities. Early on a Wednesday morning, Japanese tourists are piling out from two buses in uniform lines and making their way to one of the three piers on their way to see spinner dolphins and possibly a humpback whale or two. An old couple is sitting nearby in picnic chairs with water canteens, a Doritos bag and sandwiches, waiting for fish to bite. Apparently, the ‘ahi aren’t running either, because the rest of the parking lot is empty, with white lines outlining spaces large enough to fit trucks with boat trailers. There are seven launch ramps here—the most of any harbor in the state—and a restaurant called Spinners Cafe, where the handwritten chalkboard menu proclaims hotcakes for breakfast. During a lull he saw boats coming loose, so he took the risk and sprinted down a pier to secure them. “Whenever the waves came in, I’d hang tightly onto a pole, and the water would be all the way up to my chest,” he says. “Someone actually called a radio station that night to say that there’s a crazy man out on the pier in Wai‘anae Harbor.” He couldn’t physically reach the boats—it was too dangerous—so he used a rope, paniolo style, and lassoed them back to the pier. As a result he gained a reputation as the Lassoing Harbormaster. People would come up to him and bet plate lunches on his roping skills, and he says he’s never had to buy one yet. The original wooden pier was built in the late 1800s to transport rice grown in Hanalei over to Honolulu. Taro, cattle and fruit were also once shipped via the pier, which was extended in 1912 and eventually replaced with concrete in the early 1920s. Back then Port Allen was the major port on Kaua‘i, with Nāwiliwili and Hanalei serving as local shipping centers. Then large-scale development turned Nāwiliwili into Kaua‘i’s primary harbor in 1930, and an improved highway system led to decreasing use of the smaller ports. Finally, as rice cultivation began to decline, Hanalei Pier fell out of use and was abandoned for shipping in 1933, marking the end of an era for ocean transportation on Kaua‘i. Today the bay’s only commercial use is for tourism activities like kayaking, charter fishing and snorkeling, while residents use the pier for fishing, swimming and sailing. More than a few nervous suitors have made their way out to the covered area at the end to pop a marriage proposal, while others have gone there to honor the end of a life by scattering the ashes of a loved one. When we get to the pier, parking is tight. A tour bus has just unloaded passengers, and the visitors pause often as they stroll along the 340-foot pier jutting out from the long beach curving like a half-moon under green mountain faces. At the far end, local kids are taking selfies, wet and giddy from leaping the ten feet or so into the water, despite the “no jumping” signs. 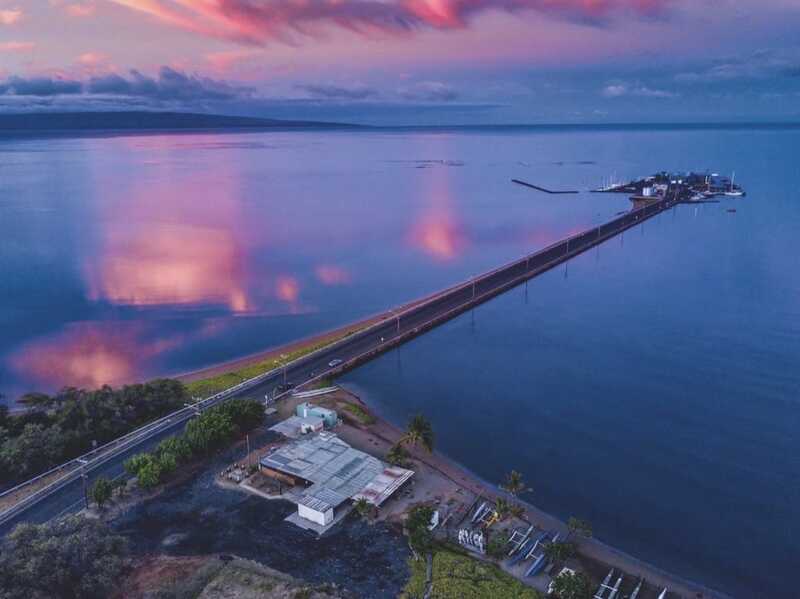 First built in 1899 to serve the island’s sugar industry, Kaunakakai Pier is now one of the last public piers in Hawai‘i still used to transport goods, supplying residents with food and other necessities. It’s drizzling when I return to the pier at dusk. Four teenage boys are strolling down it, each with a poke bowl in his hands. They sit down at the tables under the roof and demolish their food with youthful energy. Elison Galiza is the confident one with an easy smile. 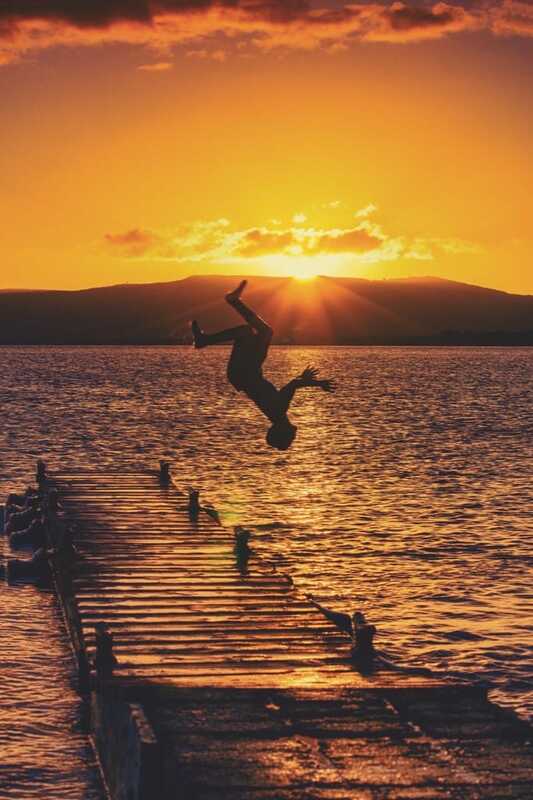 Turns out, he’s also the one who goes for thrills; he recently grazed the back of his head bloody after misjudging a backward somersault off the pier. Other kids have gotten into worse scrapes, especially the ones who climb their way up to the roof. Broken toes and arms, fractured skulls—all in the name of adrenaline. “Jumping off the pier is a rite of passage for us Hanalei kids,” Elison says with a daredevil glint in his eyes. “We try to see how many somersaults and flips we can do. I know some kids go up to the roof to get more elevation.” “Yah, ‘cause you’re crazy,” says his friend, and they all laugh.